My first symptom of heart problems was at the end of the Berlin marathon in September 2009. I finished the race and became quite unwell, nauseous, shaky and my heart was racing. I laid down, slept it off and tried to ignore the nagging thoughts that something was wrong. Berlin was my second marathon that year, and I had completed my first triathlon in between. A few months later, after continued difficulties running, chest pain, breathlessness and with my lips and fingers turning purple-blue color frequently, I insisted to my doctor that something was really wrong. An echo showed a large atrial septal defect. The natural thing for me to do in the lead up to my surgery was to research as much as possible. I searched forums, desperate to find someone who had been through the same thing. I read books, spoke to doctors online and then I found Ironheart. Ironheart to me was a huge relief, a light in the dark, which introduced me to people who knew exactly what I was going through. At the time, triathlon and completing the marathon I had to postpone was so important and one of the main reasons for trying to stay positive. Speaking to inspirational people who had heart disease or a defect like mine and had gone on to do Ironman, I just cannot put into words how much that meant to me. In the UK, I struggled to get my doctors to understand my situation, to explain to them why sport was so important to me and to try to get realistic goals from them post heart surgery. I knew most members of Ironheart were from the U.S. at the time, so comparing our diagnosis, treatment and recovery was so helpful. I wanted to be a part of raising awareness of congenital heart defects, especially in the UK. Through Ironheart I have been able to do this, through my blog and being contacted directly from those with questions I had asked a few years earlier. Two years after having my open heart surgery, I completed my Ironman. That was my dream fulfilled. The feeling of achievement was overwhelming and it will be something I will never forget. 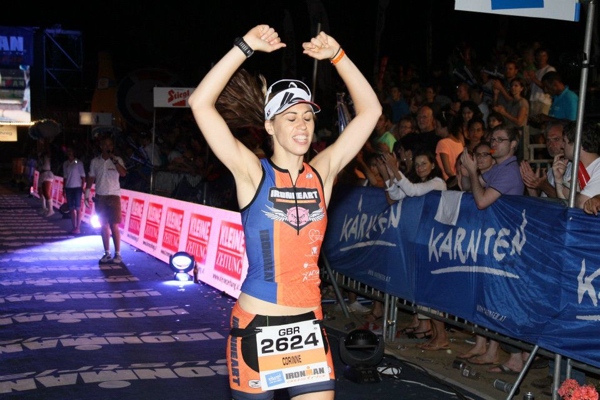 All through the experience, I had unwavering support from Ironheart members. Over three years later, my outlook has changed. My cardiologist advised me that long distance triathlon was a no go, my heart simply couldn’t take it. This took some time to get over. Now, I simply run within my limits, swim, enjoy the feeling of now pressure to push my body past what it can do. Racing will always be a love of mine and I hope to do at least one more marathon! To anyone who has been battling with heart disease, take time to find the support of those going through the same battle. Reach out to others, learn from their experiences, mistakes and massive achievements! Know your body, but also know your inner strength. Only you can ensure you put physical challenges behind you and chase those BIG dreams!